Over the past century, industrialised nations around the world have built robust government-funded national research enterprises, none more formidable than the United States’ National Institutes of Health and the National Science Foundation. Each of these organisations — including Japan’s RIKEN, Inserm in France, Britain’s Medical Research Council and the recently formed European Research Council — has advanced science by infusing the universal human impulse for discovery with national or regional pride. Despite the unarguable success of the nationally focused model of science that has dominated the past hundred years, the truly vexing problems now facing humanity — such as environmental degradation; the global climate crisis and its effects on health; emerging infectious diseases and pandemics; and the need for alternative energy sources — call for building something new: A global framework to support fundamental scientific research that cleaves more closely to Chekhov’s ideal. This week in Washington, scientists from around the world will exchange ideas at the annual meeting of the American Association of the Advancement of Science during 13 sessions held under the banner of ‘Cultivating Borderless Research’, reflecting a mounting interest among scientists in transcending national and regional barriers. Fortunately, an inspiring model of international commitment for the common benefit already exists in the Paris Agreement for climate change mitigation. The 2015 agreement, which recognises global climate change as one of the most daunting challenges faced by humankind, has the signatures of 194 nations plus the European Union, and lays out commitments to support the collective actions needed for long-term global benefit. Though the Paris Agreement has been subject to criticism that it is based on aspirations rather than mandates, it is nonetheless an unprecedented achievement in global cooperation towards a shared and urgent goal and a powerful example of what humanity can achieve through inclusive, careful negotiations conducted in good faith. By implementing the equivalent of a Paris Agreement for long-term, cooperative, international support of scientific research — to complement the nation-based organisations that have served us so well — we can better embrace far-sighted, strategic scientific planning. Arming the world with collectively acquired new scientific knowledge would allow us to anticipate crises that ultimately affect us all, freeing us from the reactive stances we so frequently must adopt in response to unexpected challenges. A global model would also provide the means to build a sustainable source of funding and freely shared scientific tools. When fiscal resources for science are bound up in national politics, year-to-year funding proposals can be unpredictable and even capricious. The Paris Agreement crucially includes robust funding to achieve its objectives, via a Green Climate Fund that has so far attracted more than $10 billion (Dh36.78 billion) in pledges. Notably, these pledges have come not just from affluent, highly industrialised countries but also from a diverse range of nations, including Mexico, Indonesia and Vietnam. 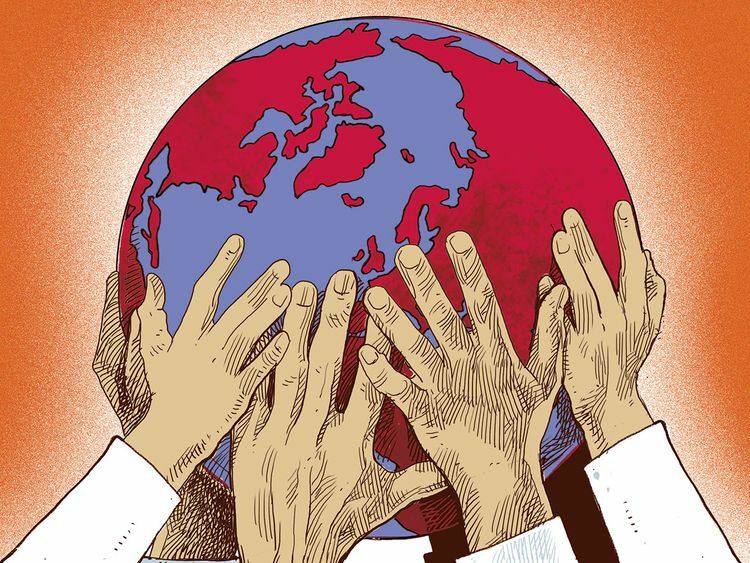 The current concentration of scientific activity in a small number of rich nations excludes the perspectives and talents of millions who stand ready to contribute to science. By actively sharing technology and data through a global framework and by building on current momentum to open the scientific publishing process to all, we can greatly accelerate the pace of discovery and increase the diversity and richness of the research we pursue. One might wonder why such global issues should be of concern to a scientist such as myself, since my decades of work on telomeres — tiny units of DNA that cap and protect the ends of chromosomes — has focused on biological events at a microscopic scale. But telomeres are known to be involved in several diseases, and they may play an important role in extending the quality of the human lifespan. Many environmental factors, from pollutants to stressful living conditions (including a lack of access to healthy food or experiencing discrimination), affect telomeres. These factors are themselves profoundly determined by large social and economic forces that do not respect national boundaries. So, as fulfilling as it has been to explore these intriguing subcellular structures at the lab bench, I have come to see that the view from my window is as important to my work as the view through my microscope. I have presented preliminary ideas on a global science framework at several international forums and received an enthusiastic response. It is my hope that young scientists and future scientists just coming of age can imagine, and eventually realise, a global pact for science — a science based on shared goals and resources, transparency and strategic, long-range thinking. We would all stand to benefit. Elizabeth H. Blackburn is a Nobel laureate in Physiology and professor emerita at the University of California at San Francisco.